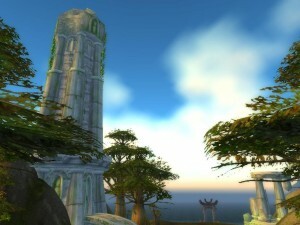 Episode #6 Timecapsule: Tucked along the coastal waters northwest of the Eastern Plaguelands, the Quel’Thalas Tower existed long before the Burning Crusade expansion gave the Blood Elves a ‘formal’ Qual’Thalas zone. This entry was posted	on Sunday, May 23rd, 2010 at 5:53 pm	and is filed under Podcast Episodes. You can follow any responses to this entry through the RSS 2.0 feed. You can skip to the end and leave a response. Pinging is currently not allowed. After I visited this location I continued down the east coast of the Kingdom. On the coast of Arathi, there is a dwarven farm I hope you will feature on a future episode! Can you tell me how I can reach this place in Cataclysm? I’ve been flying around for some time but I keep hitting invisible walls.